1914 - The first National Making Up Oscar Wilde Quotes Championship is held in Surrey, Southamptonshire, Boxbridge, England. 1929 - Just months after the Wall Street Crash of 1929, hungry bread line patrons celebrate Oscar Wilde Appreciation Day by reading his works to distract them from the biting cold and their shoeless state. 1969 - The IBM CICS is made generally available for the 360 mainframe computer. The first use of this computer is to print out a copy of Wilde's article De Profundis. 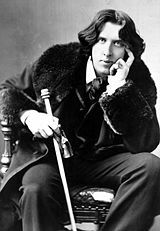 2007 - Online misinformation source Uncyclopedia places its entry on Oscar Wilde on the front page for the day, and encourages even more of his famous sayings to be posted in various places througout the site.